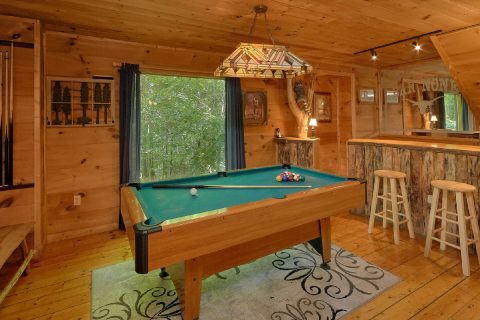 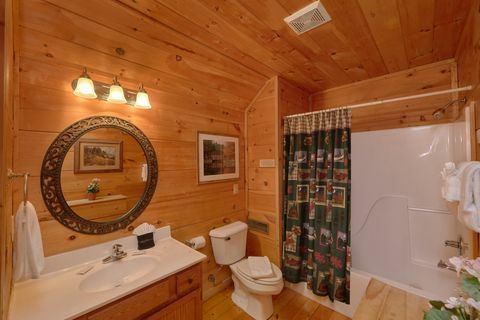 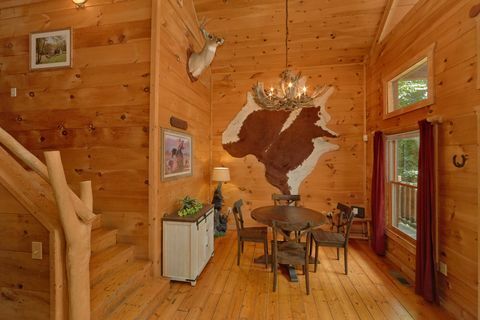 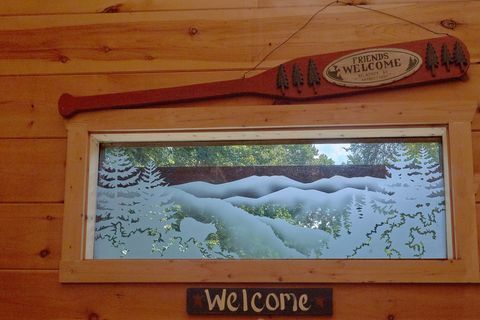 Welcome to "Bar None," your Pigeon Forge 4 Star cabin in the Smokies. 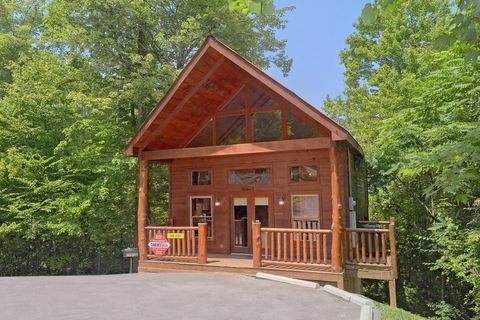 This beautiful Smoky Mountain 2 bedroom cabin rental between Pigeon Forge and Gatlinburg places guests just minutes from attractions, shows, and more! 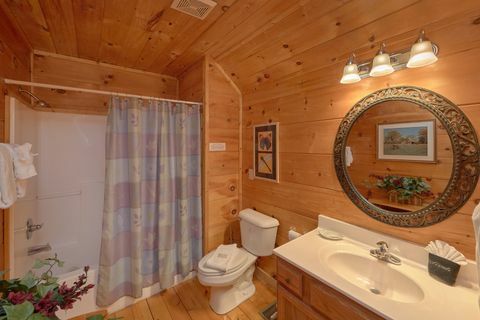 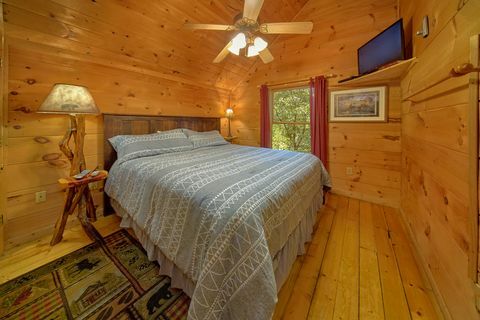 This 2-bedroom cabin in the Smokies accommodates up to 6 guests and its location in Sky Harbor Resort places visitors close to all the action of the Smokies. 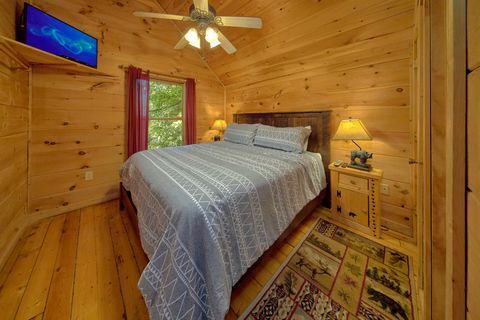 This adorable Pigeon Forge 5-star cabin combines modern amenities with rustic charm creating the atmosphere of a cozy mountain lodge. 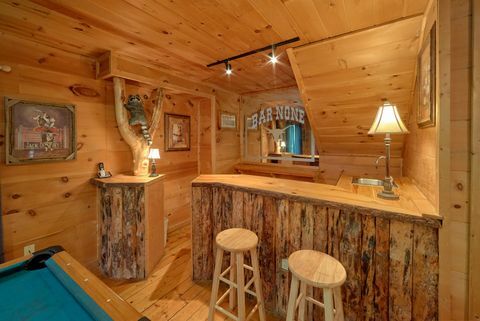 "Bar None" is an absolute delight with attention paid to every detail in the cabin, ensuring your Smoky Mountain cabin experience will be truly special. 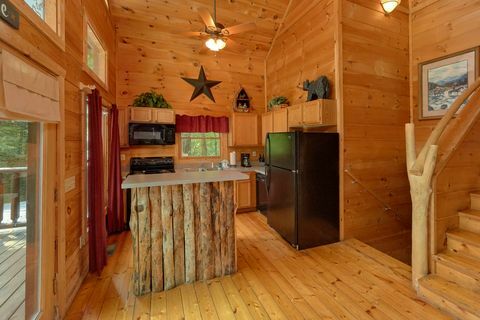 First entering this lovely cabin in the Smokies, guests step into the kitchen with enough cabinet and counter space to cook meals for the whole family to enjoy at dining table across the room. 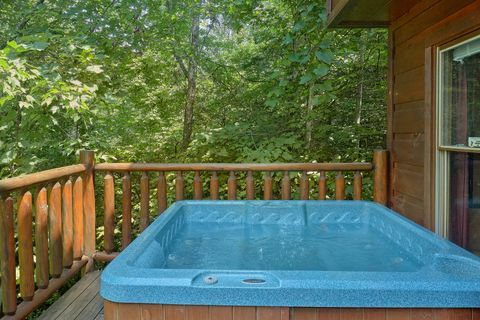 Take a few steps down and you're in the large, open game room with wet bar, pool table, television, seasonal gas log fireplace, full bath, and seating area with sofa bed. 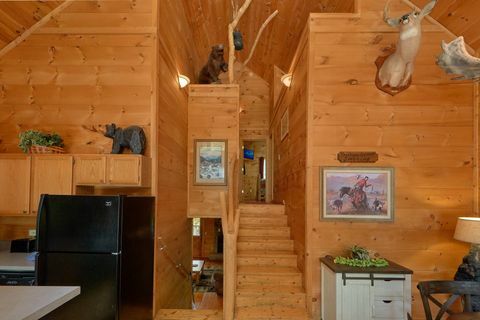 Upstairs, on the third level are two queen bedrooms - each with a personal television and full bath with jacuzzi tub. 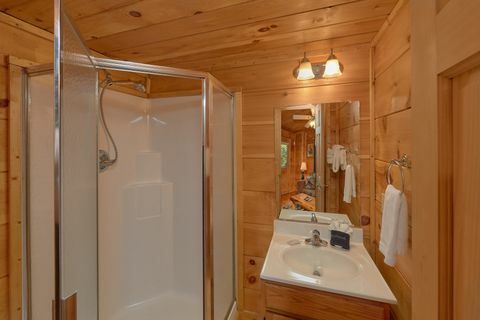 Outside, your Pigeon Forge 5-star cabin boasts plenty of features as well. 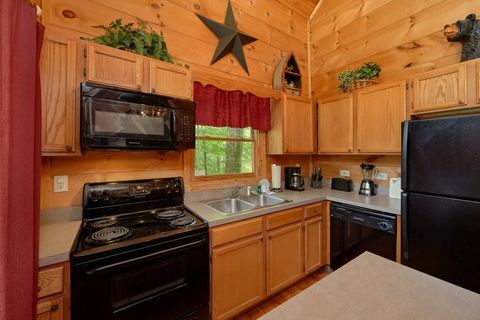 A charcoal grill is located in the front of your cabin for cookouts in the mountain air. 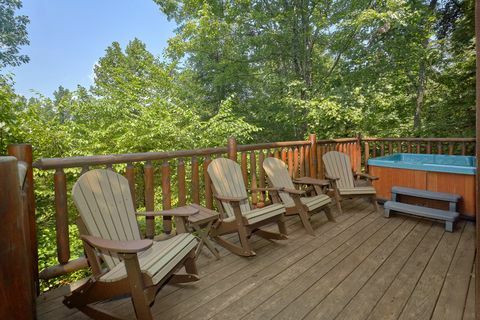 The back deck boasts plenty of rockers to sit back and enjoy the sunset in as well as a year-round family-sized hot tub for relaxation in the serene mountain setting. 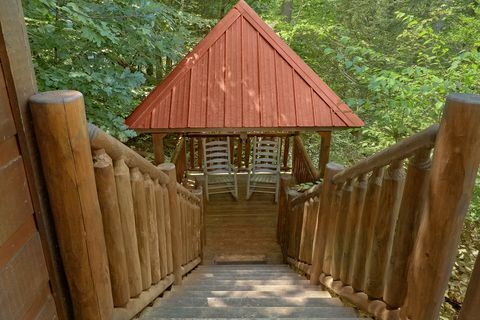 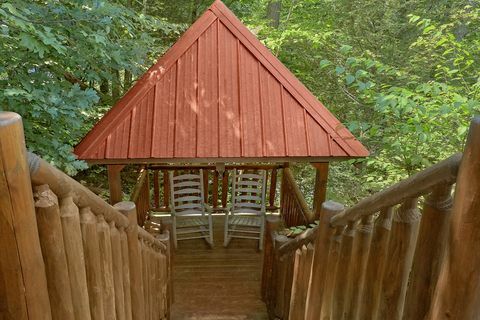 Additionally, this cabin in the Smokies offers a shaded gazebo with a ceiling fan that's perfect for in-cabin weddings and family photo opportunities. 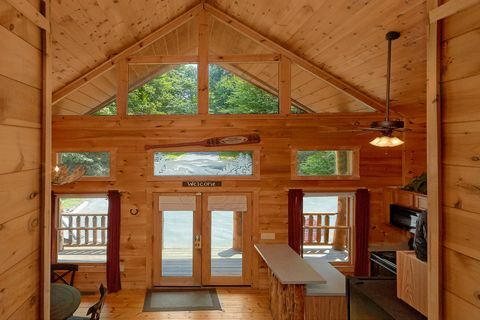 With this cabin's WiFi Internet, you can easily share beautiful pictures of your vacation with friends and family back home! Give your family an adventure when you stay in this highly affordable Pigeon Forge 4 Star cabin in the Smokies. 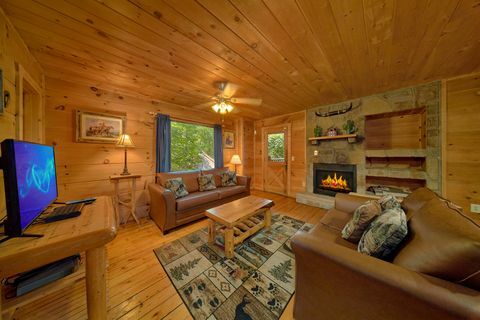 Remember, book your Smoky Mountain 2 bedroom cabin rental online with Cabins USA and you get an immediate Online Cabin Discount!